Join us along with The Rhode Island Historical Society for the annual HP Lovecraft walking tour featuring places that were important to his life and his work around Providence, RI. Tours cost $10 and can be purchased at the start of the tour. The tour begins at the John Brown House Museum, 52 Power Street, Providence, RI 02906 from Noon-1:30. 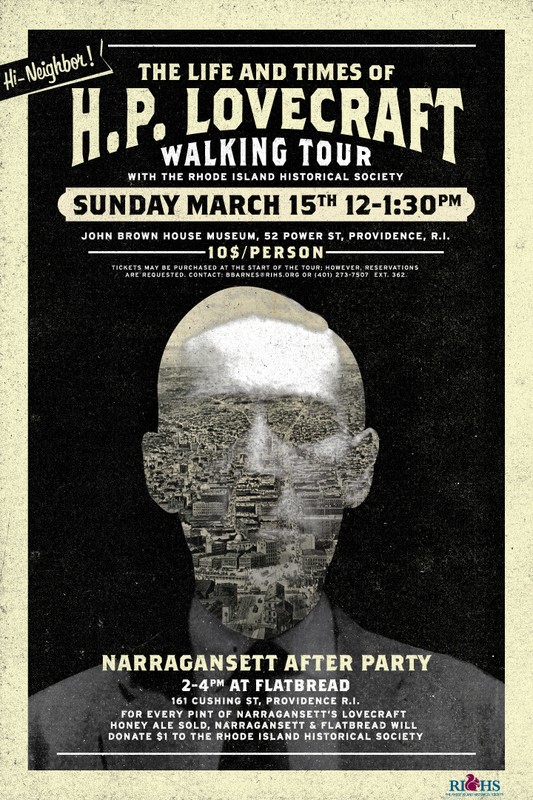 After the walk, join us to support The Rhode Island Historical Society at Flatbread, 161 Cushing Street Providence, RI from 2-4 pm for the Narragansett After Party. This is your LAST CHANCE to enjoy some honey ale before its gone. For each pint sold, Flatbread along with Narragansett Beer will donate $1 to the Rhode Island Historical Society. For more information contact The Rhode Island Historical Society at (401) 273-7507.